He has designed and planned the world's most expensive hotels. But inside John Elliott's £2.25 million home on the edge of Putney Heath there are no crystal chandeliers, marble and gold bathrooms or any other signs of the opulence he is normally associated with. 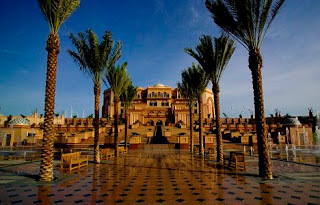 John was architect of the Emirates Palace Hotel in Abu Dhabi, estimated to have cost £2 billion when it opened in 2004. But while dedicating his career to designing seven-star hotels that fetch £8,000 a night from the world's richest guests, he insists he has been equally satisfied restoring and extending the simpler, cleaner lines of his Thirties West London house. When John, 73, first laid eyes on the home he named Moonside, it was in dire need of repair, but he leapt at the chance to rescue this early example of modern design. The property was built in 1935 by Thomas Wallis, an architect who designed the Tate Gallery and the Hoover factory, just as the Modern Movement began to influence residential UK architecture. 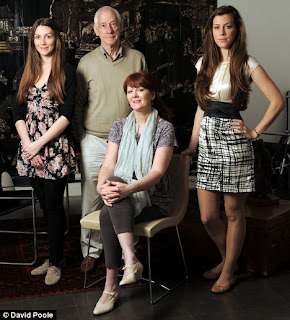 Now, after 18 years, John, with his wife Erica, 56, and daughters Kelsey, a 26-year-old interior designer, and Yolande, 25, a fashion model, is selling up to move to France. He retired earlier this year from his role as senior vice-president of Wimberly Allison Tong & Goo (WATG), one of the world's largest hotel design groups, although he is still in high demand working freelance in the United Arab Emirates and Africa. 'I loved the responsibility of improving this house while at the same time preserving the original vision,' says John. He and his wife plan to buy a house in the South of France. In his long career, John has been responsible for designing the exclusive hotel accommodation at Jumeirah Beach Residence in Dubai and a palace for the Sultan of Brunei. Before Moonside, John lived in Hong Kong for seven years, but in 1991 he was invited to open a London branch of WATG so he moved back to this country and a five-bedroom house in Poole, Dorset. Unable to sell his Poole house for 18 months when the previous property recession kicked in, John quickly tired of the long commute to London and began looking for a home in the capital. 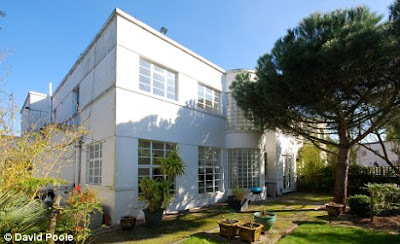 A friend in Putney Heath alerted him to a house being sold under probate in a cul-de-sac filled with similar flat-roofed and white-rendered Thirties homes. 'I bought it for a bargain £235,000,' says John, 'but the roof leaked, the bathrooms needed replacing and the whole house needed rewiring and replumbing. He spent an estimated £400,000, adding a rear dining area and a fourth bedroom above it, both looking on to a moderate-size garden. Then at the front he added a flat-roofed porch and a new single-storey double garage, planting exotic ferns and palm trees behind restored boundary walls. The integrated garage was converted into a downstairs annexe, with a bedroom, bathroom and kitchenette, and John moved the main kitchen to the other side of the house to utilise the inviting French windows for the perfect informal dining space. Upstairs, he created a small study and utility room as well as a stunning en suite bathroom for the master bedroom. 'The Modern Movement was about making everything clean and simple,' says John. Everywhere you look there are signs of good design, especially in hidden full-length wall cupboards offering a cunningly concealed downstairs toilet and storage to compensate for the lack of loft. The kitchen may be from IKEA and the floors Amtico, but the Brazilian granite worktop and careful selection of floor patterns show John's careful approach. The most striking feature of the house is the centrepiece staircase at the end of the long hallway. The spiral steel steps have a glass-block exterior wall following their curves and fill the room with light. John initially intended to retire eight years ago, but WATG was busier than ever at the start of the last decade so he stayed. •Bedrooms: Five, one in a downstairs annexe. •Bathrooms: Three, one en suite, and one cloakroom. •Reception rooms: Kitchen/diner, open-plan lounge/diner. •Outside: Front and back gardens, double garage. Agent: Hamptons, 020 8780 0077. Alistair Shaw, of Hamptons' Putney branch, says prices in Putney have recovered to 2007 pre-crash levels. The growth has been fuelled by shortage of supply - the first quarter saw demand up by 79 per cent compared with this time last year, but supply was down 30 per cent. 'Most are cash buyers who realise they have to pull out every stop to secure the property they want,' says Shaw. Outstanding design ,each one is unique and looks great.